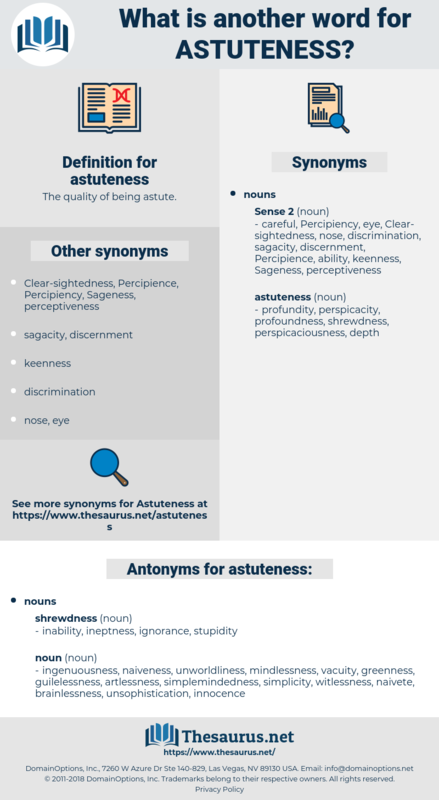 What is another word for astuteness? The quality of being astute. ingenuousness, naiveness, unworldliness, mindlessness, vacuity, greenness, guilelessness, artlessness, simplemindedness, simplicity, witlessness, naivete, brainlessness, unsophistication, innocence. We are indebted for its development to the astuteness of our distinguished representative. 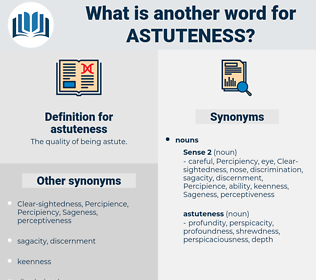 acting, astonish, agedness, azotemic, actinozoa, agitating, asthenic, auction house, actinic, acuteness, acetonic, actinomyces, actuating, accidence, actinomycosis, acquittance, academic, assistance. craftiness, insightfulness, wiliness, street smarts, slyness, knowingness, guile, foxiness, craft, acumen, cunning.